There are several ways to tell whether a roof needs either a repair or replacement from a local Palo Alto roofing company like Shelton Roofing. The National Roofing Contractors Association (NRCA) recommended that homeowners perform a roof inspection at least twice a year, ideally done in spring and in fall when the weather isn’t too harsh. According to NRCA experts, the best place to begin the inspection is indoors, specifically in the attic. Homeowners should take note of four main trouble spots: places where the roof deck is sagging, signs of water damage, dark spots and trails, and outside light shining through the roof. After checking inside, it’s time to go out and verify how the roof looks like from an exterior viewpoint. One should look for obvious damage first: missing shingles, cracked tiles, warped or gapping wood shakes, and the like. Also, homeowners should check if the roof line is perfectly horizontal. This can be done by following the roof line with the eyes; if there is a noticeable sag in the line, it is a clear indication of a structural problem created by an untreated roof leak. Calling a professional once the sag is detected is highly recommended. 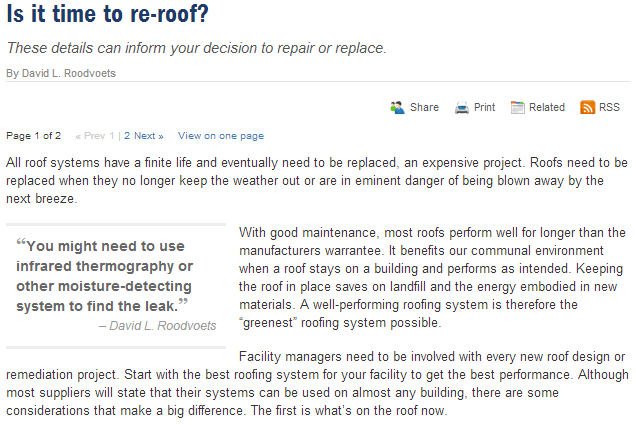 A homeowner must take note of the roof’s composition, as well. Determining whether professional re-roofing in Palo Alto is necessary will depend on the roofing material, as well as the immediate locale. For instance, cedar roofs that need repair or replacement will split and fall apart in dry climates, and a tile roof requiring immediate attention will sport broken or cracked tiles. If the roof has wooden shakes, one should also watch out for damage caused by termites, carpenter ants, and other wood-breeding pests.